Carole P. Roman is the award-winning author of over fifty children's books. Whether it's pirates, princesses, or discovering the world around us, her books have enchanted educators, parents, and her diverse audience of children. She hosts two blog radio programs and is one of the founders of a new magazine, Indie Author's Monthly. She's been interviewed twice by Forbes Magazine. Carole has co-authored a self-help book, Navigating Indieworld: A Beginners Guide to Self-Publishing and Marketing. Oh Susannah is her first Early Reader Chapter book series. She lives on Long Island with her husband and near her children and grandchildren. Fribbet the Frog has a problem. He is not okay and he is scared. 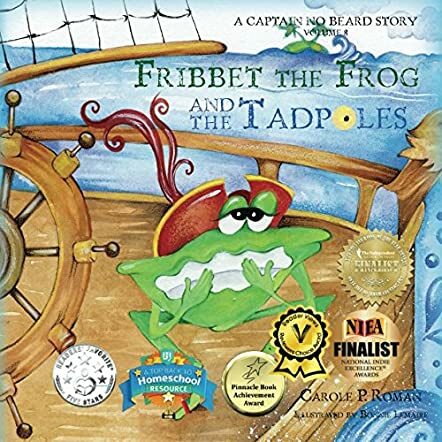 In Fribbet the Frog and the Tadpoles: A Captain No Beard Story: Volume 8 by Carole P. Roman, Fribbet tells Captain No Beard that monsters, snakes, or loud noises don't scare him, but things are changing in his home and that is worrying him. The crew encourages him to talk so that he can get over it. He tells them there were all these eggs on his lily pad, on the leaves, and in the water. Now the eggs have hatched and his house is full of things that look like fish and they all eventually lost their tails. Captain No Beard and the other crew members tell Fribbet that his family is growing larger and he has brothers and sisters. It is a story of friendship and introduces smaller children to the life cycle of the frog. There are lessons about family too when Captain No Beard explains to Fribbet about family and how Cayla and he are brother and sister, and how having her as a sister is worth it. Children learn about family and the changes that can happen in a family with the passage of time. The illustrations are, as always, bright, lively, and they make the story vivid and the characters come to life. As with the other stories in the series, this is good for bedtime storytelling and can be used for interactive sessions in classrooms. When science and story are woven together, children will find learning new things fascinating, just like in this story. A new character is introduced into the story. Who is it? I find him cute and adorable. Let us know if you like him!